While the standard dermabrasion techniques that involve scalpels are designed to be used on a variety of skin types, they may not be optimal for everyone. They may even cause certain side effects that could be worse than the skin issues that you are currently facing. Microneedling at Skin and Beyond in Irvine is an alternative that can successfully achieve the same things as standard dermabrasion as well as extra benefits to your skin. With several tiny needles in the tip, Dermapen Created Micro Punctures when moved over the skin of treated areas. Depending upon the depth of the puncture and where it is located, your skin’s natural healing response will be stimulated, increasing the blood flow, evening out skin texture, reducing the visibility of blemishes, and encouraging collagen production. Gradually, this creates skin that is not only smoother and softer but also has a natural, youthful glow. The best part of the Dermapen® procedure is that there are few, if any, signs that the procedure has occurred. 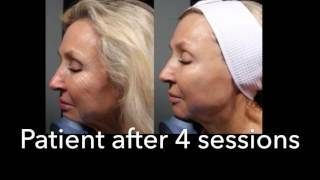 The incredibly fine needle makes it possible to safely promote skin rejuvenation in Irvine, CA without having to worry about others noticing that you have had a treatment done. What Are the Benefits of Dermapen®? The action of poking the skin with a fine needle is simple in concept, but it has numerous effects that vary depending upon the location and depth of the punctures that occur during the procedure. For example, Dermapen® can be applied to the outermost layer of the skin to remove dead skin cells and other topological blemishes. This is one of the most common applications of the Dermapen® procedure, as it can effectively remove the majority of particles that lead to clogged pores and oily skin. The ability of the Dermapen® to penetrate the basal and dermis layers of the skin can also have a significant impact on acne scars, stretch marks and wrinkles that can be difficult to treat effectively. The formulation of new collagen ensures that the skin will continue to improve, reducing the appearance of these blemishes over time. Regardless of the depth of the procedure or the purpose, the treatment itself provides real results that cannot be created withcreams or lotions. You can see results almost immediately after your first treatment when the Dermapen® procedure is used on the upper layers of the skin. After treatment, skin may appear red or pink for the first two days afterward. Discoloration and swelling should decrease significantly by the third day. Any complications you may experience should be relatively minor and treatable by our medical team. Dermapen® in Orange County can exfoliate skin, remove dead cells, and treat problems that reside far underneath your skin without the use of chemicals, making it a favorable treatment for all skin types and ages. In addition to the benefits listed above, Dermapen® in Orange County is considered safer than other rejuvenation treatments due to the reduced risk of pigmentation side effects that may occur with alternative methods.